It seems that January 1, 2014 is set to go down in history as the stay-at-home New Year, as 20 million Britons decided to watch TV rather than go out. Maybe due to the appalling weather, 999 service strikes and public transport problems, many Britons preferred staying in and watch TV rather than venturing out to celebrate the New Year. 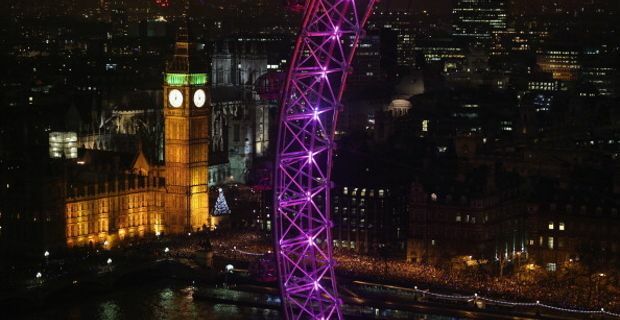 The BBC said 14.1 million people were watching e chimes of Big Ben and the spectacular Thames-side firework display on BBC One at midnight, while a further 6m were watching other channels. One has to allow, however, that many people may have opted for a good old indoor celebration with family and friends, where there almost always happened to be a telly on, at least for the countdown to midnight. If we look at it this way, we can say that the New Year's Eve TV shows provided a background to many a home party, which paints a rather happier picture than 20 million Britons spending the midnight staring at a television screen. One thing is for sure: the wet weather did not stop people in London to flood the centre for the eventful night. London Metropolitan police said the public viewing areas for the capital’s firework display quickly filled up with around 250,000 people. Although there were 100 arrests and 85 tons of rubbish left over, including more than 15,000 empty champagne and wine bottles, the Met also said that NYE celebrations in the capital had been “good-natured”. Unfortunately though, this has not been the case for the country overall, as two people died and two more are fighting for their lives due to accidents happened during celebrations. Former amateur boxer Mark Denton, 31, of Hartlepool, Cleveland, died after a fight at a house party on New Year's Eve, while another 31-year-old died in similar circumstances Hythe, near Southampton. Meanwhile,a 17-year-old boy was hit by a car and killed as he walked home in the early hours of New Year’s Day in Rochester, Kent.